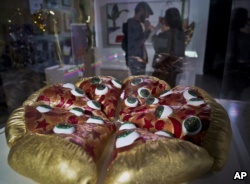 A three-dimensional sculpture from artist Shawna X called 'Say Cheese,' is part of a group art exhibition celebrating pizza at The Museum of Pizza in New York, Nov. 2, 2018. But instead, Raye got some of everything. 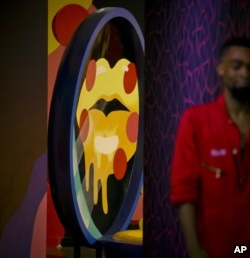 "So you get a little bit of education and then some fun, which I love,' she said. 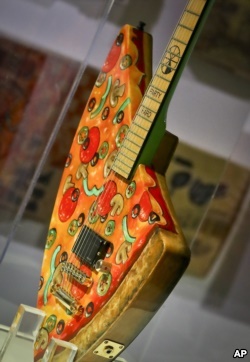 The 'Pizza Guitar,' from musician Andrew W.K., is part of a group art exhibition celebrating pizza at The Museum of Pizza in New York, Nov. 2, 2018.